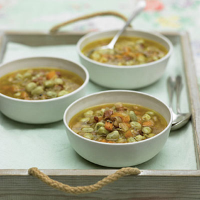 Salty, cured pork is the perfect partner to broad beans and both serve to flavour this soup well. It can also be made with stores of frozen broad beans for a quick, warming supper. Heat the olive oil in a large saucepan or casserole and add the pancetta and onion. Cook over a medium heat for 5 minutes until the onion has softened and the pancetta cooked. Add the garlic, leeks and carrots. Cover and leave to soften over a low heat for 15 minutes, stirring occasionally. Once everything has softened, add the broad beans and the stock. Bring to the boil and simmer for 20 minutes until the beans are tender. Spoon 2 large ladles of the mixture into a blender and purée. Stir this back into the soup so that it thickens a little. Season and serve with a drizzle of olive oil.